In a previous blog, I examined the long-term occupational patterns of people with engineering degrees. 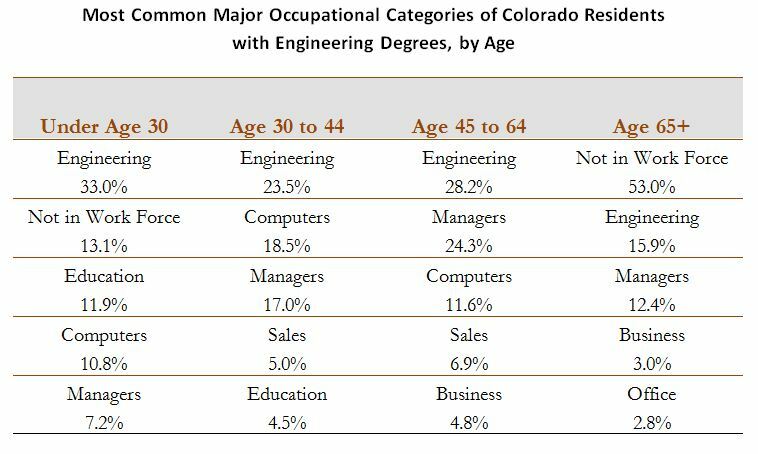 Looking at a sample of 1,250 Colorado residents who hold bachelor’s degrees in engineering, I examined their current occupations. Now, one might expect that career choices might grow more diverse with age. My theory before examining the data was that younger engineering grads would be more likely to work in classic engineering jobs, while older grads are more likely to find other opportunities as their interests evolve and they become exposed to other opportunities. Annnnd, my theory was wrong. When we examine the proportion of jobs held by engineering graduates of different ages, we don’t see a strong pattern. Regardless of age, roughly half of engineering grads are working directly in technical fields. Note – Data includes only employed persons. While employment in technical occupations doesn’t vary by age, there are some minor differences, as seen above. Younger grads are more likely to be classic engineers, and haven’t worked up to management levels yet. In fact, their profile is very similar to those age 50 to 64 if we assume that rises to management levels occur over time. Those in the 65+ age category are similar to the next generation after them, but without a significant presence in computer fields. Perhaps the most interesting group is the 30-44 age group. They are more likely than any other age group to be in computer occupations, and less likely to be a classic engineer. Is th is a function of their generation in particular, or will the younger engineers migrate toward computer occupations as they age? Only time will tell. Note: Figures include both working and non-working individuals. Computer and manager occupations in this table do not differentiate between technical and non-technical occupations. The above table shows the rise to management among some engineering grads, and also movement into sales for those in the middle age categories, as well as the bulge in computer workers in the 30 to 44 group. Among the Under 30 group, we see a significant portion not in the work force, which is primarily students going straight to graduate school, as well as teachers, mostly at the college level.